"Old money" means the pounds, shillings and pence system we used in the UK until 15 February 1971. On that day Britain switched to the decimal system we use today, where one hundred pence make one pound. There were three units of currency: the penny, the shilling and the pound. 12 x 20 = 240 pence in a pound. How did you write amounts in pounds, shillings and pence? The British system used the abbreviations £ for pound, 's' for shilling and 'd' for pence. They are abbreviations for the Latin words libra, solidus and denarius, or LSD. You could say 'how much is that in LSD?'. Libra meant pound, solidus meant shilling and denarius meant penny. Solidus and denarius were Roman coins, libra was a Roman pound. The origins of pounds, shillings and pence go back to ancient times. The other common abbreviation was the '/' symbol to divide amounts in shillings and pence. So 15 shillings and 6 pence was 15s 6d or 15/6. If there were no pence you could use /- for a quantity in shillings, so 5/- for 5 shillings. For example, a jar of instant coffee might cost 2/3 - 2s 3d or two shillings and three pence. What were the old money coins? Farthings, halfpennies and pennies were bronze. The threepenny bit was brass. It had twelve sides. Before 1937 the threepenny bit was silver. There was a tradition of putting a threepeny bit or a silver sixpence in a Christmas pudding for a lucky child to find. The sixpence, shilling, two shillings and half crown coins were silver. They were real silver before 1920. There was also a crown coin which the Royal Mint issued on special occasions. For larger amounts, there were banknotes. 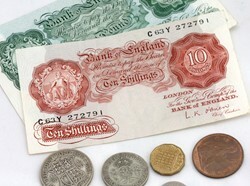 There was also a ten shilling note (worth 50p in decimal) £1, £5 and £10 notes. How much did things cost in old money? In 1970, before the UK changed to decimal currency, money had much more buying power. For 1970 pricers, imagine one shilling as 50p today, two shillings as £1 and half a crown as £1.25. In earlier times, they were worth more. When the War ended in 1945, one shilling would have been worth £1.50 in today's money and in the 1930s between £2.30 and £2.50. So how much was a can of baked beans? So what is that in today's money? Translating these prices at face value, they work out at 15p for a lb of butter, 4p for the baked beans, 7p for the cornflakes, 11p for the coffee and 10p for the Omo. But what about inflation? According to the retail price index, prices have gone up by a factor of twelve since 1965. So taking inflation into account, these prices would have been £1.25 for a lb of butter, 48p for a lb of baked beans, 84p for 12oz of cornflakes, £1.32 for 2oz of Nescafe and £1.20 for a 1lb of Omo. One guinea was 21 shillings - that is one pound and one shilling. There were no guinea coins in the twentieth century. But you still got bills in guineas from solicitors, accountants and other professionals. If you went on holiday you might have to settle your hotel bill in guineas. It was a way of sounding posh and also making a bill seem a little bit smaller than it actually was - a bit like £9.99 instead of £10. You might hear the term bob for a shilling. The Boy Scouts did 'Bob a job' week. In my day the Scouting Movement discouraged the term. They wanted more than a bob a job in the high inflation days of the 1970s. A tanner was a sixpence. When were £sd coins and notes no longer legal tender? The Royal Mint withdrew the farthing on 1 January 1961, well before the UK Government made any decision on decimalisation. When the Government decided to introduce decimal currency, the Royal Mint withdrew a few of the £sd coins. The Bank of England called in the ten shilling note on 22 November 1970. This meant it was no longer legal tender, but you could still can take it to the Bank of England and change it for 50p. The penny and threepence were still legal tender on D-Day (Decimal Day), 15 February 1971. You could still use them to pay for goods in new and old money until 1 September 1971 , when they were withdrawn. This worked because 6d was 2½ in decimal. The remaining £sd coins had a much longer life. The sixpence continued in use until 30 June 1980 and was no longer legal tender from 1 July 1980. The Royal Mint withdrew the shilling and florin (two shillings) coins when it introduced the new smaller 5p and 10p coins. The shilling remained legal tender until 30 December 1990 and the florin or two shilling piece until 30 June 1993. So the last day you could legally spend a £sd coin or note was 30 June 1993. The two shilling piece or florin was first struck in 1849 in Queen Victoria's reign as a small step towards decimal currency. The first florins were marked 'One tenth of a pound'. So it was both Britain's first decimal coin and the last pre-decimal coin. What were the oldest coins in circulation? Before Britain went decimal in 1971, the oldest legal tender coins were 1816 silver half crowns, shillings and sixpences from George III's reign. The shilling remained legal tender until 1990. The oldest legal tender florin was the first one from 1849. Pennies, halfpennies and farthings from 1860 were the oldest bronze coins still legal before 1971. Why use a non-decimal system? In the days before computers and calculators, this was useful for trading. From 1968, to be ready for decimalisation, the Royal Mint started to mint decimal coins. They started with coins denominated in 'New Pence' of values five and ten. They worked with the old system as they were direct replacements for the one and two shilling pieces. In those days today's pence were 'new pence'. "I am looking to buy a few pennies from 1959 as it was the year of my birth. Are you able to help me please? "I'm a film maker and have been trying to find what a cup of coffee would have cost in 1971. I remember it increased beyond reason in a local Milk Bar the day after decimalisation but cant remember the actual price - 5p? 6p? from a pre Feb '71 price of about 4d? "You make it sound so complicated and it really wasn't. One thing which has always annoyed me since D-Day is this: The singular was previously "one penny" and the plural was "two pence", "three pence", "four pence" (usually pronounced "tuppence", "thrippence"), "fourpence" all the way up to "elevenpence". That is just standard English. It has nothing to do with currency and therefore nothing to do with decimal conversion. "I agree with you Pete - I think it annoys many people. However it is not the only abuse of our great language these days! "In 1970 Little Chef charged 9d for a cup of tea or 4p. A cup of coffee was 1/3 or 9p. At Golden Egg, earlier in the 60s coffee was 1/- and tea 6d. However, they charged 1/3 for coffee and 9d for tea on Saturday after 6pm and all day Sunday. "In 1913 our local council spent Â£29 5s and 10d on park maintenance for the month. How much would this be now? Can anyone help please? This is a very useful site, though I see that no questions have been asked since 2015. A vintage clock I bought recently had a label inside which said that it had been purchased for 18 shillings in 1955. The clock is late 19thc, and I thought that 18/- was not a lot to pay in 1955. What would that be in today's money? "It would have been Â£2.87 1/2. 17 shillings is 17 x 5p and 6d is 2.5 new pence. If you bought the album at that price in 1969, it would have been Â£32 in today's money. "Britain and Ireland should not have decimalized the pound into 100 new pence; it should have been 200. Australia, New Zealand and South Africa got this right. The only difference is, since their respective pounds weren't as important to the world as the British pound was, they were able to start with a clean slate. What Britain should have done is decimalize the shilling into 10 new pence. By then no-one would grieve the loss of the sixpence; it'd be five new pence. Same value, different name. "I'm reading a script, set in 1971, where they mention money, specifically " 2 and 6"
When did the predecimal coins and paper money become, as legal tender, worthless? There will be more coming on banknotes soon. Apart from the 10s note the other denominations were still legal tender as they were in round pounds and not affected by decimalisation. One Florin is two shillings and two sixpences are one shilling. So you have 3 shillings. One threepence and four pennies is 7 pence. So you have 3 shillings and 7 pence, 3s 7d or 3/7.